For years Rialto public leaders have used your tax dollars to go on lavish trips all over the nation. The situation got so bad that an audit 4 years ago led Councilman O’Connell to ask the Council to approve measures that would bring travel spending under control. These changes were short lived as Mayor Robertson has allowed commisoners to travel on the tax payers dime and now the city council has a $99,000 travel budget for the year. Our Mayor has used the Mayors Conference to use your tax dollars to spend time taking selfies with Presedent Obama in the distant background and eating rich food and staying in 4 star accomidations. All of these are luxuries that the people of Rialto will never get the chance to enjoy. Mayor robertson was questioned for bringing City Clerk McGee with her to lavish travel destinations with no clear reason for the City Clerk to atend. Now Mayor Robertson is making good on a campaign promise, reports are that if she won she would be taking Cheif Randy Deanda to Washington DC with her. Well we found out how this abuse of tax dollars would bare out. Mayor Robertson is taking Cheif Deanda and Lt. Paul Stella with her to Washington DC has her own personal Security Detail!!!!!!! 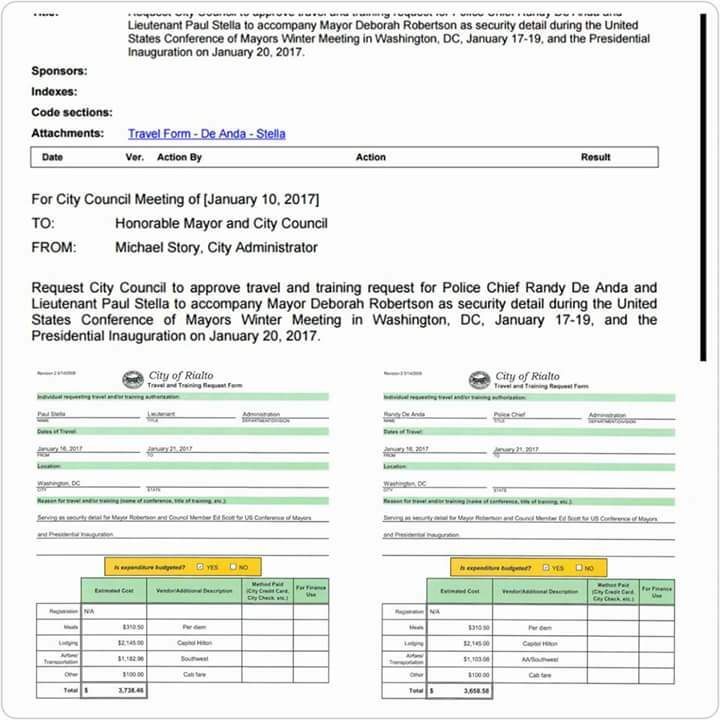 Lets break down these travel requests that total more than $7,000!!!!!! Where in the budget are they pulling this money? Why are we paying for 4 seperate cab fare’s when they are supposed to be security detail? How much is the overtime going to cost with these two not being home doing their duties? We spoke to current Mayors, Council Members and Former Elected leaders and nobody has heard of ever brining their own security detail to any travel. In addition those attending the Trump Swearing in are not brining in their own security they are relying on the Washigton DC city, county and federal law enforcement officers to keep everyone safe. Residents already on edge after freshman Councilman Rafael Trujillo tried to start Rialto down the road of becoming a Sanctuary City are wondering what is happening to their city. One resident said “when will our council and mayor just do what is right for us” and another said “if Mayor Robertson couldn’t have her raise she will get her money one way or another”. On top of this $7,000 travel bill for security Mayor Robertson is spending $3,200 minimum on this trip. It is unclear if the taxpayers are paying for Councilman Ed Scott’s travel as well. Unless someone comes to their senses this will be approved on Tuesday January 10th 2017 at 6pm.